On this day in 1931, gangster Al Capone is sentenced to 11 years in prison for tax evasion and fined $80,000, signaling the downfall of one of the most notorious criminals of the 1920s and 1930s. 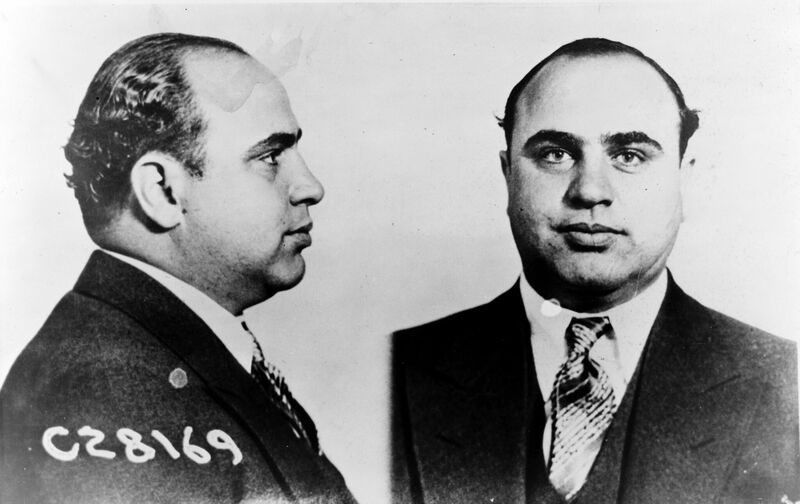 Alphonse Gabriel Capone was born in Brooklyn, New York, in 1899 to Italian immigrants. He was expelled from school at 14, joined a gang and earned his nickname “Scarface” after being sliced across the cheek during a fight. By 1920, Capone had moved to Chicago, where he was soon helping to run crime boss Johnny Torrio’s illegal enterprises, which included alcohol-smuggling, gambling and prostitution. Torrio retired in 1925 after an attempt on his life and Capone, known for his cunning and brutality, was put in charge of the organization. Prohibition, which outlawed the brewing and distribution of alcohol and lasted from 1920 to 1933, proved extremely lucrative for bootleggers and gangsters like Capone, who raked in millions from his underworld activities. Capone was at the top of the F.B.I.’s “Most Wanted” list by 1930, but he avoided long stints in jail until 1931 by bribing city officials, intimidating witnesses and maintaining various hideouts. He became Chicago’s crime kingpin by wiping out his competitors through a series of gangland battles and slayings, including the infamous St. Valentine’s Day Massacre in 1929, when Capone’s men gunned down seven rivals. This event helped raise Capone’s notoriety to a national level. Among Capone’s enemies was federal agent Elliot Ness, who led a team of officers known as “The Untouchables” because they couldn’t be corrupted. Ness and his men routinely broke up Capone’s bootlegging businesses, but it was tax-evasion charges that finally stuck and landed Capone in prison in 1931. Capone began serving his time at the U.S. Penitentiary in Atlanta, but amid accusations that he was manipulating the system and receiving cushy treatment, he was transferred to the maximum-security lockup at Alcatraz Island, in California’s San Francisco Bay. He got out early in 1939 for good behavior, after spending his final year in prison in a hospital, suffering from syphilis. Plagued by health problems for the rest of his life, Capone died in 1947 at age 48 at his home in Palm Island, Florida.